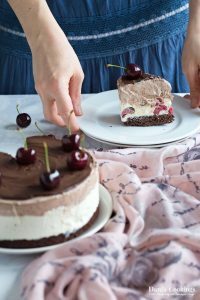 Made completely from scratch, this Easy Black Forest No Churn Ice Cream Cake is a very tasty combination of brownie base, vanilla cherry ice cream and chocolate ice cream. It is topped with chocolate glaze and fresh cherries! And you need less than an hour to prepare all that deliciousness before putting it in the freezer. It might sound surreal but surely you too can make the same cake by following the recipe below. Since I discovered that I can prepare fantastic homemade no churn ice cream, I am almost totally ignoring the store bought kinds. My first homemade recipe was the No Churn Lemon Cheesecake Ice Cream. It turned out really delicious and I also received great feedback from people who made it. I realised that there are so many wonderful ice cream variations that can be prepared just in the freezer. I was so excited with that realisation that I decided to try a homemade completely from scratch No Churn Ice Cream Cake. That was a really big deal! I know some of you might not like to read personal revelations and sentimental childhood memories but I need to make a small confession in order to give you the background why that cake means a lot to me. When I was a kid the simple wording “Ice Cream Cake” for me translated into “the greatest deliciousness that have ever been invented in the universe and that only good kids can have once in 100 years”. Yes, indeed, during my childhood in the 1980s in Bulgaria the ice cream cake was a legendary dessert that I have been promised to have but I don’t think I ever saw in the stores. So I only got the chance to try this famous dessert around the time when I was already 15 or 20 years old. I can’t recall the very first time I got the opportunity to eat a piece of ice cream cake but I can only remember that it was somehow disappointing. After so many years the concept of ice cream cake doesn’t seem that exciting to me any more. I think one of the main reasons is because the good ones are not easily found. But believe it or not, the current cake is among the best I have ever tried! What makes this Easy Black Forest No Churn Ice Cream Cake so good? It has a tasty brownie base on the bottom. The vanilla cherry ice cream layer is creamy and full of frozen fresh cherries. The chocolate layer is very delicious and creamy as well. The combination of chocolate, cherry and vanilla is simply great. And to be honest, only after tasting it I realised that it was actually a “Black forest” dessert. Same as many of my other recipes, this one is also very quick and easy. I made the cake one evening, almost half sleeping – certainly not in my best shape. And in case it is not the cherry season when you decide to follow this recipe: you can make it with jam instead of fresh cherries or with any other nice fruits that you might like. It will not be Black Forest any more but it will be still delicious for sure! Line a 18-20 cm (7-8 inch) cake pan with a circle of baking paper. Grease well the pan on top of the paper. In a bowl combine flour and baking powder and whisk. In a heatproof bowl combine cocoa powder, sugar and butter. Place the bowl in a pan of gently simmering water and mix until the butter is almost melted and all ingredients are combined. Transfer the mixture into a mixing bowl and whisk energetically until the remaining butter pieces melt completely. Add the egg (make sure it is at room temperature) and whisk until homogeneous. Carefully fold in the flour mixture. Transfer the brownie batter into the prepared pan. Bake for about 15 minutes or until a toothpick inserted in the centre comes out clean. Let the brownie cool on a wire rack until room temperature. In a large mixing bowl beat together cream cheese, condensed milk and vanilla until smooth. Using a rubber spatula fold the whipped cream into the condensed milk mixture. When the two mixtures are combined, divide the resulting ice cream base in two equal parts (simply transfer half of it into the bowl where the cream was whipped). Add the chopped cherries into one half and stir gently until they are evenly distributed. Place the brownie base on a serving plate and put a cake ring around it. Alternatively place the base in the spring form pan where it has been baked. Spoon the cherry vanilla ice cream mixture on top and smooth it with a spatula. 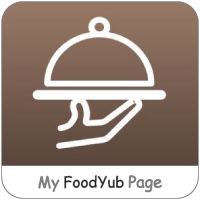 Place the pan/ the plate in the freezer while preparing the chocolate mixture. Melt the chocolate combined with the sea salt over a pan of gently simmering water. Using a rubber spatula carefully fold the chocolate into the second half of the vanilla ice cream mixture. Mix gently until uniform. Spoon the chocolate ice cream on top of the vanilla-cherry layer. Smooth with a spatula and cover with a cling film. Melt the chocolate together with the milk over a pan of simmering water. Mix well, until homogeneous. Let the glaze sit for 5-10 minutes, until reaching room temperature. Take the frozen cake out of the freezer. In about 5 minutes remove the cake ring. Spoon the glaze on top of the cake and smooth it out. Decorate the cake with fresh cherries. Keep leftovers in the freezer, covered well with cling film. Before cutting and serving always let the cake stay at room temperature for 10-15 minutes.